On Wednesday, April 29, Orange County Mayor Teresa Jacobs joined high-wire walker Nik Wallenda, Gov. 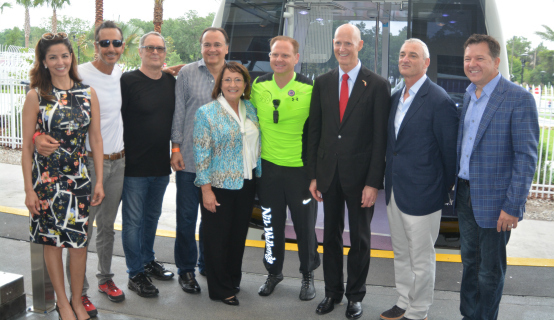 Rick Scott and other dignitaries for the opening of Orlando Eye, the centerpiece of the new $250 million I-Drive 360 complex, which features a blend of attractions, restaurants, clubs and shops, on the world-famous International Drive. Wallenda walked the edge of the 400-foot-high spinning wheel without a harness or wire and set a new Guinness World Record that was televised live on NBC’s “Today” show. Wallenda is recognized around the world for his stunning acrobatic stunts and high wire performances, including crossing the Grand Canyon, walking over Niagara Falls and crossing two Chicago skyscrapers, the latter of which while blindfolded. “In addition to bringing an amazing new attraction to the heart of our tourism corridor, the opening of the Orlando Eye also marks a time of great transformation and reinvention for our region,” Mayor Jacobs said. More than 62 million people visited Orlando in 2014, a new all-time record for the U.S. travel industry, solidifying Orlando’s position as the most-visited destination in the nation. “With this grand opening event, we expand the reach of Florida’s reputation as a great place to do business, and the best place for family or luxury entertainment,” Mayor Jacobs said. The observation wheel’s air-conditioned cabins will hold dozens of guests in each car, offering them a bird’s eye view of Central Florida when it opens to the public on May 4. I-Drive 360 is additionally anchored by the world-famous Madame Tussaud’s, an immersive and interactive wax experience—SEA LIFE Orlando Aquarium, which features a 360-degree ocean tunnel and more than 5,000 creatures, and the unique Skeletons: Animals Unveiled! Experience, which features the skeletons of 400 different species. Accompanying the entertainment experiences, visitors can enjoy a diverse array of dining and nightlife options such as Yard House, Tin Roof, Sugar Factory and more. Sean and Catherine Lowe, stars of ABC’s “The Bachelor,” experienced the exciting blend of attractions firsthand, as Catherine celebrated her golden birthday – 29 years old on the 29th – at the complex. I-Drive 360 is in the heart of Orange County’s central tourism district which is south of the internationally-recognized Orange County Convention Center (OCCC) – the second largest convention facility in America. Last year, the Convention Center drew roughly 1.3 million attendees, contributing approximately $2.1 billion in economic impact to Central Florida’s economy. A record 32 million room nights were sold in Orlando in 2014, resulting in Tourist Development Tax (TDT) collections topping $200 million for the first time in Orange County’s history. To meet the needs of a growing number of visitors, Orange County has made investments in infrastructure, including investing in an important expansion and renovation of the OCCC to continue drawing domestic and international convention business. In addition to enchanting visitors, Central Florida’s robust travel and hospitality industry adds enormously to the quality of life for Orange County citizens. Thanks to TDT revenues, the Orlando Citrus Bowl stadium was renovated into an essentially “new” NFL-style stadium, with cutting-edge technology and fan amenities. TDT funds have also contributed to building the acclaimed Dr. Phillips Center for the Performing Arts, the renowned Amway Center – the gold standard in NBA facilities for fans and athletes alike, and the new MLS Soccer Stadium.